Following three semi-final events held in Hong Kong, London and New York, the 12 fashion labels to compete in the global final of the 2018/19 International Woolmark Prize have been decided. Chosen from more than 300 applicants from across 46 countries, the winners are amongst the most promising fashion design talents from across the globe and will each gain a financial contribution of AU$70,000 for the development of their business and capsule collection. Finalists will be invited to compete in the prestigious global final to be held in London in February 2019 as well as receiving mentoring support from a global panel of experts, showcasing opportunities and a Woolmark licence, one of the world’s best-known textile quality fibre brands providing a unique, global fibre quality assurance for consumers. 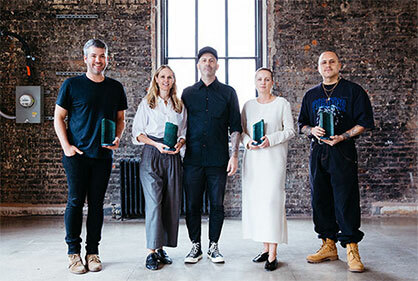 “Now in its seventh year the International Woolmark Prize has evolved into one of the biggest fashion awards of its calibre and so we have restructured the program to ensure our nominees and finalists receive the highest level of industry support and guidance,” explains The Woolmark Company Managing Director Stuart McCullough. For the next seven months, the finalists will be required to develop a capsule collection of six looks in Merino wool, to be showcased at an extraordinary event that will highlight the 12 finalists selected from across the globe. One menswear and one womenswear winner will receive a further AU$200,000 financial contribution at the global final, as well as mentoring from industry experts to help propel their business to the next stage. One finalist will also be selected for the second edition of the Innovation Award which celebrates the most innovative and creative wool fabrications, process or development and rewards the finalist with a financial contribution of AU$100,000. The total combined amount a prize winner has the potential to win is AU$370,000. In addition, winners will have the opportunity to have their collection distributed through the prize’s prestigious international retail partner network which includes Boutique 1, Boon the Shop, David Jones, Harvey Nichols, Hudson’s Bay Company, Lane Crawford, LECLAIREUR, Mytheresa.com, Parlour X, SSENSE.com, Sugar, Takashimaya, Tata CLIQ Luxury and ORDRE.com. A panel comprising designer Rahul Mishra; Managing Editor Esquire Hong Kong Angus Lui; GRAZIA Middle East Editor-in-Chief Alison Tay; 10 and 10 Men Magazine Australia Editor Alison Veness; 10 and 10 Men Magazine Australia Associate Editor Rebecca Khoury; ORDRE Co-Founder and Fashion Director Kirsten Lock; Lane Crawford Womenswear Buyer Tawny Leung and Takashimaya Womenswear Buyer Ayako Midorikawa and Menswear Buyer Keiko Kadosugi selected the four winners. As a designer whose origins lie in engineering, i-am-chen’s vision is free of fashion norms and is instead inspired by 20th century artists, blurring the lines between fashion, art, textiles and technology. For her International Woolmark Prize collection, designer Zhi Chen took inspiration from the works of American abstract painter Agnes Martin, focusing on classic elements such as grids, lines, points and tartans. While Martin subtly expresses her emotion through traditional shapes and lines, Chen hints her minimalistic design under the intricate yarn swatches in explosive colours. Chen hopes to re-interpret these traditional shapes and exploit the most advanced knitting machines to perform totally new and pioneering techniques. Angel Chen took inspiration from the lifestyle, independent spirit and determination of deep sea female diver Haenyeo from the Hado Village, in Jeju, South Korea. Chen referenced diving suits, wool bathing suits from the late 1920s, and the 1930s ‘Topper’ wool swimsuit produced by Jantzen, reinterpreting these silhouettes and transforming the pieces into contemporary ready-to-wear with a colour palette of red, orange, green, pink and yellow – a signature touch that the label has developed through its notorious use of exuberant colours. The collection’s unisex outerwear carried functional detailing utilising bonded wool fabrics to make the collection waterproof, wind proof, breathable and thermoregulating. The starting point for Yohei Ohno’s collection concept was research of Japanese archival fabrics where they discovered a unique deadstock summer-weight fabric from Bishu, famous for wool production in Japan. In less than ten years the fabric has been replaced by synthetics. Ohno wants to take these classic wool fabrics and rework them in a modern context, to create collections that are more relevant and challenge the concept of women’s suiting by renewing woollen fabrics and unique colour palette. “I combine modern forms with traditional fabrics to create something new for this generation adding my balance of playful design and functionality for the modern woman. For this I turn to architectural and sculptural forms for constructive silhouettes, looking at the different shapes, colour and texture to give my collection more of an industrial character,” explained Yohei Ohno. “Yohei is refreshingly new in their approach to design, and I like their design principle in that there’s not just a top or a dress, but that they mix techniques and styles to create something fresh,” said Mishra. “I am honoured to win this prize and it represents a great opportunity to expand our brand to the worldwide market,” explains Mooyeol Lee. A panel comprising Tim Blanks, Editor-at-Large, The Business of Fashion; Stylist Catherine Baba; Jefferson Hack, Founder of Dazed Media; Designer Roland Mouret; Christiane Arp, Editor-in-Chief of Vogue Germany; Gert Jonkers, Co-Founder of Fantastic Man; Sara Sozzani Maino, Deputy Editor-in-Chief, Vogue Italia, and Head of Vogue Talents; and Tiffany Hsu, Fashion Director, Mytheresa.com, selected the four winners. Daniel W. Fletcher’s collection is inspired by traditional British clothing, and with wool itself being one of the oldest fabrics in the world, he sought to focus on technologically advanced iterations of the fibre, offering a new take on the historical fabric. Whilst the collection nods to the past, the fabrics look to the future. One of the most notable uses is in the sculptural scarves which appear to be almost frozen in mid-air. To achieve this, the designer experimented with weaving thin wires into a lightweight Merino to re-inforce it and give it a mouldable quality which can easily create dramatic shapes whilst remaining light and easy to wear. Elsewhere, Fletcher used high performance 'Merino Perform WP', which is made from 100% Australian Merino wool which is pre-stretched and spun into yarn before being woven to create a fabric that is both wind- and rain-resistant, breathable and resilient, and yet remains uncoated. By remaining uncoated it means it is natural, renewable and biodegradable. Daniel W. Fletcher’s collection is inspired by traditional British clothing, and with wool itself being one of the oldest fabrics in the world, he sought to focus on technologically advanced iterations of the fibre, offering a new take on the historical fabric. Whilst the collection nods to the past, the fabrics look to the future. One of the most notable uses is in the sculptural scarves which appear to be almost frozen in mid-air. To achieve this, the designer experimented with weaving thin wires into a lightweight Merino to re-inforce it and give it a mouldable quality which can easily create dramatic shapes whilst remaining light and easy to wear. Elsewhere, Fletcher used high performance 'Merino Perform WP', which is made from 100% Australian Merino wool which is pre-stretched and spun into yarn before being woven to create a fabric that is both wind- and rain-resistant, breathable and resilient, and yet remains uncoated. By remaining uncoated it means it is natural, renewable and biodegradable. The starting point for Edward Crutchley’s collection began by looking at textiles within material culture and the role they play in the expression of identity. Inspirations as varied as French Breton lace, Javanese court dress batik prints, the embroidery-covered column-like silhouettes of eastern Europe and Japanese kabuki costumes all feature, but the designer also looked outside of traditional cultural signifiers to more subcultural references, too. The most immediately identifiable is the Biker jacket: an icon in and of itself, but re-imagined along the lines of an exploded 18th century frock coat. Grungy surfer tie-dye on American collegiate knit structures made by the head of the Kyoto Guild of Shibori Masters is the ultimate blending of contemporary culture with the traditional skills of the artisan. With a focus and commitment to use almost exclusively pure Merino yarns within the collection, Crutchley highlights and celebrates the varied nature of the raw material. Merino wool’s fineness is shown through the innovative use of pure wool embroidery threads, while warmth and comfort become evident in garment-engineered blanket fabrics where the fluffy halo of Merino lambswool has minimal finishing but uses hi-tech looms and the skill of the jacquard engineer to create ground-breaking pattern applications. Shine and drape can be seen in quarter milled tailoring fabrics which have been calendar pressed to imitate dolphin skin. This all-year-round-weight flannel shows the potential for pure wool suiting as a commercially successful summer suiting fabric. Meanwhile, a unique outerwear finishing gives the feeling of a viable alternative to leather. “My goal in putting such a variety of inspirations alongside one another is to celebrate their uniqueness and, ultimately, our own connections to them. My aim with this collection is to show the diverse nature of Merino wool and the myriad possibilities that become available with different construction and finishing techniques,” said Crutchley. “I’ve worked in fabric development for a long time and am really involved in how textiles evolve, and to be recognised for that is so incredibly exciting for me, and I’m really excited to move forward in this competition,” said Crutchley. Nicholas Daley’s collection SLYGO takes its name from Nicholas’ father’s DJ alias and draws direct inspiration from his parents’ club night known as The Reggae Klub, which ran from 1978-1982, in and around Scotland. Preserving the rich heritage of British craft, Nicholas Daley worked closely with established mills in the UK to expand notions of British sartorialism. The SS19 SLYGO collection features bespoke fabrics that underlined Daley's key relationships with manufacturers and mills, creating a bespoke tartan check Merino wool fabric, experimenting knitting with jute yarn mixed with Merino wool yarns, using rubberised bonded Merino wool and traditional mackintosh seam-taping techniques. An important aspect of production is to reduce the waste produced from Daley's collections, recycling fabrics to create yarn strips, which will then be knitted into accessories. CMMN SWDN’s signature use of unexpected pairings is at play across all elements of the collection. Well-loved garments are recreated in Merino wool through knowingly awkward proportions and are pared against technical base-layer seamless sheer knits. Treasured hand-me-downs are reimagined in new Merino wool with unravelled traditional Swedish twined knits and superfine Merino wool ‘mended’ together, bonding the layers using a needle-punching technique at Italian knitwear manufacturers Punto Art. The irregular forms of the knit recall the distortions that naturally occur from human hands in the restoration process and are finished with darning, a traditional mending technique. An oversized double-breasted trench coat in a water-repellent Merino wool coating resembles a favourite piece handed down through the generations with linings extending beyond the raw hem and cuffs as if the garment has shrunk over the years with the lining still intact. Seamless patches feature on tailoring, mapping out areas that typically experience wear by fusing two separate Merino wool suiting wools with a needle-punch felting technique at Portuguese embroidery house, Lisabor. Classic tailoring is reimagined into five-pocket trousers with exposed raw edges and heavy Merino wool twill mimics the appearance of a hard-wearing denim. Silver foil is screen-printed onto five pocket tailored trousers to expose the under layer of Merino by imitating the crease folds and faded areas of a well-loved pair of jeans. Natural hues emphasise a sense of comfort and tactility and are contrasted with accents of metallic silver and lime. A panel comprising Hudson’s Bay & The Room Fashion Director Tyler Franch; Designer, Founder And Creative Director Gabriela Hearst; Diet Prada Co-founders Tony Liu and Lindsey Schuyler; W Magazine Editor-In-Chief Stefano Tonchi; Ordre.com Fashion Director/Founder Kirsten Lock; Council Of Fashion Designers Of America CEO Steven Kolb; Malcolm Carfrae - Founder, Carfrae Consulting and International Woolmark Prize mentor; The Woolmark Company Head of Americas Michelle Lee; and GQ Creative Director-At-Large Jim Moore selected the four winners. ALBUS LUMEN proposes to use Australian Merino wool in a way that challenges common misconceptions about the fibre while emphasising ALBUS LUMEN’s easy, free spirit. The all-white capsule collection, titled 'Para Interna' (Latin for Pure Discovery), highlights the ethereal lightness of Merino wool and focuses on the textural possibilities of the fabrics. ALBUS LUMEN’s use of small-scale quilting and the textural effects created by mixing Australian Merino wool with linen and silk blends adds subtle yet striking contrasts to the all-white palette, while shell and baroque pearl surface detailing - both ALBUS LUMEN signatures - enhance the lightness and the natural beauty of Australian Merino wool. “It is extremely exciting to be taking ALBUS LUMEN to the next level using Merino wool and using new technologies,” said designer Marino Afonina. Brandon Maxwell’s collection concept is inspired by the country clubbers, sailors, yachters, golfers and power walkers; and also those who would rather look as if they are going to perform an endurance activity but instead opt for a nice glass of champagne at the bar. This capsule collection can cover the wearer for any activity; the fabric technology can handle full activity performance and the design is created to make the wearer look fabulous doing anything or nothing at all. In doing so, Brandon Maxwell creates a more chic athleisure wear market where the need for comfortability is met with well-constructed design. Using innovative knitting technology to create seamless, luxury, sportswear garments that are comfortable, fashionable, and high performing, this collection highlights the technical benefits of wool in the athleisure market. Inspired by chic vintage tennis, archery and cycling uniforms as well as the early-1930s and -40s workwear created from wool before the advent of synthetic fibers, Colovos' collection references classic wool sportswear and workwear throughout history, updated with modern proportions and patterning techniques. The collection is made of lightweight wools that are comfortable, seasonless and effortless and can be worn everyday just like your favourite pair of jeans. Colovos sourced new wool qualities with innovative weaving techniques and contemporary finishes that evoke the look and feel of other natural fabrics like denim, cotton poplin, and silk, but with a more elevated feel with all the benefits and natural innovative properties of wool. Workwear and futurism were the guides in WILLY CHAVARRIA’s most sustainable and technically advanced collection to date. By working with The Bear Scouts and the Suedwolle Group in Germany, the designer sourced the best sustainable yarns and suppliers to develop body map base-layer garments for both athletic and leisure wear. “This collection is the story of the American experience,” says Chavarria. Optimistic and titled FUTURISMO, the collection embraces both the traditional aspects of wool with innovation and its plush, comforting qualities. Bold silhouettes are surprisingly soft to the touch, and outerwear looks strong and powerful but feel nurturing with Merino wool lining. Styles combine American blue-collar workwear with the function of technical athletic apparel, on which Chavarria says: “I see this as the present and the future.” An oversized woven zip hoodie is worn with knitted pants made with body-mapping technology to combine and contrast comfort with space-age engineering, in fits that are more relaxed than typical sportswear. In line with The Woolmark Company’s ethos of supporting emerging talent, the 2018/19 International Woolmark Prize trophy was designed and manufactured by Central Saint Martin’s MA Material Futures graduate Charlotte Kidger. With an elegant yet bold form the trophy is designed to allow the material - the waste plastic deriving from Computer Numerical Control fabrication - to be seen and celebrated in its raw form. “The aim of this body of work was to find ways of utilising and repurposing industrial material waste streams diverting the material from landfill sites and incineration. Finding beauty in this abundant source of raw material I have transformed it from waste to something of desirability and beauty with longevity and durability at its forefront,” explains Charlotte.